EBENSBURG — Three pitches made all the difference in Thursday’s District 6 Class 1A quarterfinal softball game at Ebensburg’s First Energy Field. Third-seeded Bishop Carroll rapped three hits off Moshannon Valley’s Sidney Lewis on three consecutive pitches in the third inning that helped the Lady Huskies put four runs on the board. That’s all they got off Lewis, and that’s all they needed in a 4-1 victory over the Damsels. With one out and Alivia Borlie on first after reaching on a fielder’s choice, Marlee Howard ripped a hard single into center field and Emma Simmons followed with a double over Damsel centerfielder Elmira Ecklund’s head. Borlie scored on the two-bagger. Carly Clark drove the very next pitch off the wall in left and cleared the bases with a 2-run triple. Adison Divido’s groundout plated Clark to give the Lady Huskies a 4-1 advantage after three. The Damsels struck first, putting an unearned run on the board in the top of the first. Madi O’Donnell singled when her hard liner went off the shin of a lunging Clark at shortstop. Ecklund followed with a bunt single to put the Damsels in business. But Lady Huskie pitcher Simmons struck out the next batter and the got Lewis to hit a fly ball to center where it was misplayed, allowing O’Donnell to score. With runners on second and third and just one out, Simmons got out of the jam with a groundout and flyout. Simmons also worked out of a second and third situation in the third with a groundout which was the start of a string of eight consecutive batters retired for the Bishop Carroll hurler. Simmons kept the Damsels off balance all game long, allowing just four hits — two to Lewis — while walking just one batter and striking out eight. Lewis also settled in after the four-run third. She allowed only two singles and hit a batter over her final three innings of work to keep the Damsels within striking distance. With the win win, Bishop Carrol advances to the D-6 Class 1A semifinals and a date with defending district champ and top seed Glendale. That contest is slated for May 24. Moshannon Valley (1): O’Donnell rf 411, Ecklund cf 401, Merritt 1b 300, Lewis p 3020 Kitko ss 300, Blake c 200, Wible cr 000, McCoy 3b 300, Anderson 2b 300, Bubb lf 200, Dotts ph 100. Totals: 28-1-4. Bishop Carroll (4): Borlie 2b 310, Howard lf 212, Simmons p 311, Clark ss 311, Divido c 300, L. Golden 3b 301, A. Golden rf 301, Beck 1b 301, McAndrew cf 301. Totals: 26-4-8. E–McAndrew 2, Borlie, Clark. 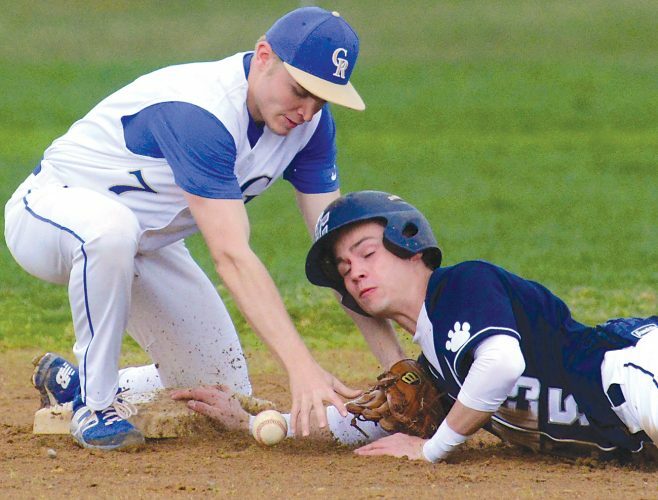 LOB–Moshannon Valley 7, Bishop Carroll 5. 2B–Simmons. 3B–Clark. RBI–Simmons, Clark 2, Divido. Moshannon Valley: Lewis (LP)–7 IP, 8 H, 4 R, 4 ER, 0 BB, 4 SO. Bishop Carroll: Simmons (WP)–7 IP, 4 H, 1 R, 0 ER, 1 BB, 8 SO.